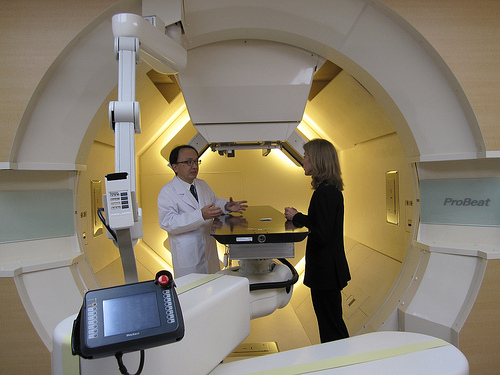 Health Costs > How Much Does Proton Therapy Cost? How Much Does Proton Therapy Cost? Today, proton therapy, a non-invasive treatment, is known to be most precise and most advanced form of radiation treatment. Unlike conventional x-ray radiation that often radiates the healthy tissue in its path, proton therapy radiates the tumor site by using proton particles to destroy the tumor, allowing the healthy tissues and organs surrounding the tumor to stay intact. Proton therapy, being a relatively new procedure, is only available in a limited number of centers in the world, and because of this, it isn’t widely available. How much does proton therapy cost per treatment? Proton therapy, when compared to traditional radiation treatments, can be four to seven times more due to the specialized equipment and expertise required to run the equipment. Without insurance, proton therapy costs can range anywhere from as little as $30,000 to more than $135,000 without insurance. MedpageToday.com says the costs of proton therapy can range from $30,000 to $120,000. In contrast, a course of radiosurgery can cost $8,000 to $12,000, but when you research the costs to build the facilities, it can cost upwards of $200 million to build a proton therapy center, when compared to $7 million to build a radiation therapy center. According to a 2008 report from the Institute for Clinical and Economic Review, the lifetime review for prostate cancer using this approach was $73,000. The American Cancer Society, according to its findings, found that Medicare pays about $19,000 for a full dose of standard radiation but more than $32,000 for proton therapy. In most cases, proton therapy will be covered by Medicare and private insurance carriers, and as long as the copays/coinsurance and deductibles are met, there are very little out-of-pocket costs. However, do keep in mind that insurance coverage is on a case-by-case basis and will greatly depend on your insurance provider, your condition, medical history and other factors. It’s always best to talk with the insurance company and facility you plan on working with to make sure you’re covered before making any appointments. Proton therapy will be performed in a specialized theater designed for this specific therapy. Before the treatment begins, the doctor will first want an MRI scan or CT scan to check the exact position of the tumor. Depending on the cancer being treated, the specialist may “strap” down the targeted area to prevent the patient from moving. Once in position, the specialist will leave the room, similar to that of an x-ray, and will begin the proton beam therapy. The beams will target the tumor, layer by layer, to a very fine detail. Depending on the size, each session could take up to 15 minutes. No anesthesia is required, and like an x-ray, a patient shouldn’t feel any pain. In some extreme cases, patients may often see some irritation on the skin, such as dryness, peeling or reddening. Before proton therapy is even considered, a doctor will want to determine if you’re a candidate for the therapy. This therapy is often recommended for cancer that hasn’t spread to any other parts of the body since the therapy can only target one specific region contained in one area. In order to determine your qualification, your doctor/specialist will want to take a look at your medical records, previous scans and will want to perform an up-to-date cancer screening. All of these tests will be an additional cost to consider and won’t be included in the estimates mentioned above. Depending on the patient’s circumstances, some may require more than one session. In some cases, some may require as many as four to five to see desirable results. To know if the treatment were successful, it could take anywhere from one to seven weeks, depending on the tumor site. As time goes on, the treatment time may decrease as the heavier dose begins to increase. In most cases, the therapy is deemed a success if cancer doesn’t come back within five years after the treatment started. Cancers that may be treatable include certain eye cancers, prostate, lung, liver, head, neck, brain and certain sarcomas. The National Association of Proton Therapy lists the many proton radiation therapy locations in the world. Financial assistance is often available to those who meet certain income requirements. Talk with your doctor or hospital’s finance department to see if they can help offset the costs. Again, check with your health insurance before setting up an appointment to ensure you’re covered adequately. In some cases, depending on your health insurance policy, you may need either pre-authorization or your health insurance company may need you to meet certain requirements before acceptance. Most of the time, a good hospital and/or doctor’s office will be able to tell you exactly what you will be responsible costs wise before your treatment sessions even begin.